1.Prepare Meatloaf: Adjust oven rack to middle position; preheat oven to 350°. Line rimmed baking pan with aluminum foil; spray with cooking spray. In large skillet, cook onion in oil over medium-high heat 5 to 7 minutes or until onion begins to brown, stirring occasionally. Add garlic and mushrooms; cook 5 to 7 minutes or until mushrooms begin to soften, stirring occasionally. Remove from heat. 2.Meanwhile, prepare Glaze: In small bowl, stir chili sauce, juice, sugar, zest and pepper. 3.In large bowl, whisk eggs; stir in broth, rosemary, mustard, Worcestershire, salt and pepper. Add cornflakes, ground chuck and mushroom mixture; gently mix until just combined. 4.Transfer meatloaf mixture to prepared pan; with wet hands, gently form into 6 x 12-inch loaf and brush with about 1/4 cup glaze. 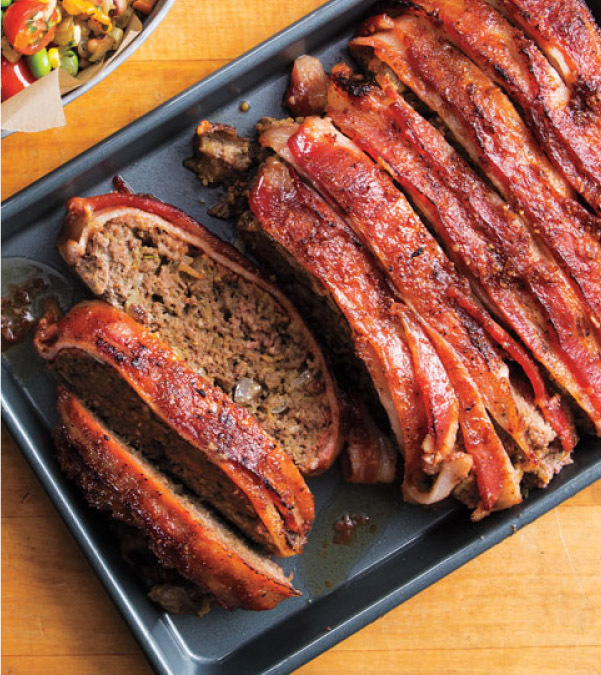 Lay bacon slices crosswise over loaf, slightly overlapping; tuck ends under loaf and brush with about ¼ cup glaze. 5.Bake loaf 40 minutes; brush with remaining glaze. Bake 20 minutes longer or until bacon begins to crisp and internal temperature of loaf reaches 160°. Let stand 15 minutes before serving.